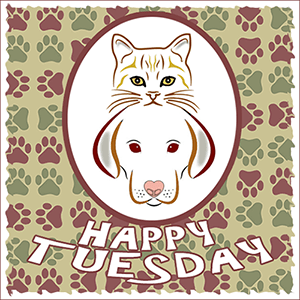 This entry was posted in A-Z Blog Challenge, Blog Hops and tagged A-Z Blogging Challenge, Comedy Plus Happy Tuesday Blog Hop, Trouble by pilch92. Bookmark the permalink. My human will never, ever use a Hartz product on any of us, EVER. She has known about them for years. Thanks for the warnings………..we’ve heard too many horror stories about these products so we hope people will listen! As for Trouble’s new Easter hat – we approve………we think Trouble has the best expressions EVER! Oh my goodness! That look on Trouble’s face is absolutely priceless! That is so true about flea products. It is so much better to get them from a vet. Have a great day. I don’t know anything about pet products since we do not have any animals but this is interesting to know and I hope others take heed to what you suggest. Happy a2zing! I am enjoying your drawings. That is so true, many years ago the Hartz flea stuff killed one of the Dad’s kitties. Never again. I think just this once Penny will be understanding. I absolutely DESPISE Hartz products. They’ve been infamous for their danger for decades. I never used anything but vet prescribed flea meds, when the need arose. Since all mine have been strictly indoors, fleas were a minimal issue and the few times meds were needed, it was for a month or two. Thanks for the tip. Very timely since flea season is here. We get our collars from our vet. I am glad you get them from the vet. This is great of you to share. Why are they allowed to still sell that garbage? Hartz has been around for a long time, used to be so well-known for pet products. They should be leading the way in making safer products. It’s really sad….and scary for those that don’t know. I don’t know why they can still sell it. They should not be able to. I only purchased things like this from the vet. I was always afraid of getting something bad. I’m happy nothing ever happened with buying these kinds of things from the vet. I 100% agree about the flea and tick stuff from the Vet. That is where I always got Angel Madi’s in fact all her meds came from the vet. Because if something went wrong and it didn’t come from the vet ….it could have been very serious. Yes, I agree…it’s the one thing to buy up! Happy Birthday, Marg! Thank you for sharing. This is a very important post! Our younger cat (our beautiful female calico) that we adopted last January from the local shelter almost died from being treated with flea and tick medication incorrectly by her previous owners. She was just a kitten at the time and she (along with some other kittens from the same household) went into seizures after they were treated. That medication almost killed her. Her previous family left her at the vets and thankfully the vet decided for whatever reason to give her a chance at life. That sweet calico made it through that near death experience and was then put up for adoption at the local SPCA where we were fortunate enough to cross paths with her. She is the sweetest, most wonderful cat and we are blessed to have her. I am so grateful to the vet (we don’t know which one it was because we’re not allowed to) who decided she was worth saving when she could easily have been put down. So I beg everyone to please be careful where you buy these types of treatments, what kind you use and how much you apply. They can be very toxic! That is very good advice. I always bought my products from either my own vet or the same products from the online veterinary supplies that they recommended. I love that look on Trouble’s face. We hope she’s having a purrfect day! Good advice. We are lucky that we have never been treated for fleas, but our mom knows to never buy stuff like that from a store. Our vet also warned her about that. Love the hat, Trouble! My foster son, Red-headed Alec, has a sister, and i paid to take her cat to the vet after she used the Hartz flea stuff. That was the cat that survived, the other one had died in the night. The whole thing was awful, and i absolutely do not recommend Hartz. In fact, the only bottle kittens i’ve ever lost to blood sugar problems were started on Hartz formula before i got them. Trouble looks wonderful in a chapeau. Nope! Never! Over the counter is verboten. And We are wishing Marg Happy Birthday a little late. Trouble’s Easter hat is just right for her! Lookin’ good! Very true. I don’t buy from our vet since they don’t carry the seresto flea collars. One of mine is deadly allergic to regular flea meds so no one can go on them. The collars are pricey but amazing. Thanks for the reminder about Hartz! Our mom forgot to talk to our vet about flea products. We don’t use any right now. I hate having a tick on me,so creepy. This is a purrfect tip for H! I have been hearing and reading so many horror stories related to certain flea and tick medications, and so you are so right that it really is best to stick to the brands that veterinarians trust and sell. This is still a money-saving tip, though, I believe. Using good, trusted brands of these medications can save people a lot of vet costs related to emergencies caused by the lesser known, more dangerous brands.